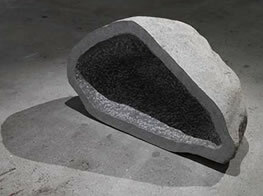 The ancient sculptural quest for the illusory - through the rendition of life-like form, or objects that appear to defy the innate characteristics of the materials from which they were cast or carved - has, in recent years, again become increasingly relevant to sculptural practice, although continuing concerns with abstraction preclude mimesis as a principal source of the beguilingly transformative. Instead, apparence and seeming are initiated through a mounting focus on the suggestive or even unexpected potential of material and form; a twist on an age-old tradition that informs the work of all four artists featured here. 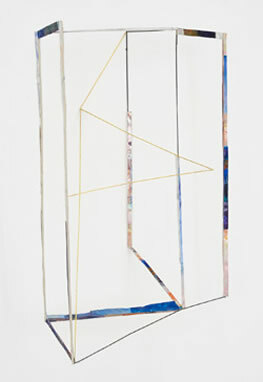 UK artist Alice Channer's practice reflects her interest in clothing and its constituent materials. The suggestive possibilities of negative space are integral to many of her works, an insinuation of volume and surface paradoxically achieved through a delineation of partial absence. One of Channer's most characteristic strategies, for example, is to remove the elasticated waistbands or cuffs from clothing and cast them in aluminium (left). Installed as wall-mounted groups or hooped onto dowelling, the absences they demarcate remind us that the human figure is continually implied, though never directly represented, throughout Channer's practice. 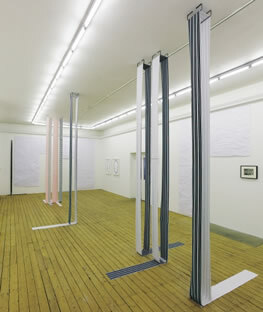 Channer's delineation of potent space is particularly effective in works such as Nu-lines (2010, left) or Eyes (2012, below, shown in background), which consists of an extensive rank of slender, wall-mounted aluminium forms covered in printed Spandex. Physical slightness is offset by expansive presence: each band encloses and defines an interior space which is complemented by the spatial interrelation of the group itself. Additionally, each slender form appears to shift dynamically as our sightlines change, and a wealth of detail on the covering fabric defies the highly reduced surface area on which it appears (the elastic nature of the Spandex also makes it capable of further expansion; an intriguing possibility to which we will return shortly). 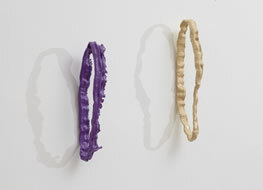 Channer's fascination with negative space and its suggestive potential is closely aligned to an interest in overturning preconceptions regarding the inherent nature and purpose of many of her materials. The planes of taut fabric in Worn-Work (2009, left), for example, entirely contradict the familiar artistic trope of fluidly arranged drapery; instead, each panel's appearance of upright rigidity is more akin to Minimalist sculpture or architectonic feature. 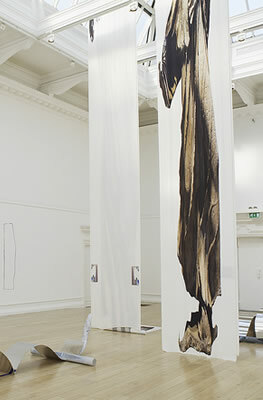 Cloth becomes almost columnar - a conceit more fully explored in the works Cold Metal Body, Large Metal Body and Warm Metal Body (2012, detail below), which include heavy crêpe de Chine hangings printed with manipulated photographs of drapery found on a trio of classical Greek sculptures. A depiction of stone-hewn 'fabric' on a length of real cloth is not only punningly wily: the reference also serves to evoke the Greek architectural column, particularly the caryatid, a tunic-draped female figure serving both as structural support and illusionary rendition of fabric and flesh. Channer's interests in negative space, implicit volume and material properties combine in her fascination with pleated fabrics and elastic, both of which possess the ability to essentially metamorphose through expansion and contraction. 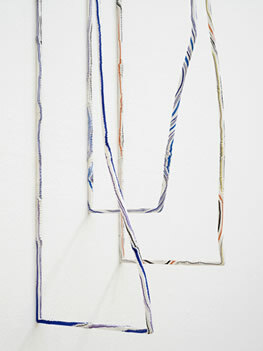 The accordion-like folds of Body Back In (2011, below), appear poised within precarious containment. Hovering between states of completion, it's a work with the innate potential to become another. Garment elastic (of which Channer apparently has an enormous collection) plays similar volumetric tricks: by casting bands of it in metal, Channer arrests stretchiness, but continues to allude to inherent mutability. 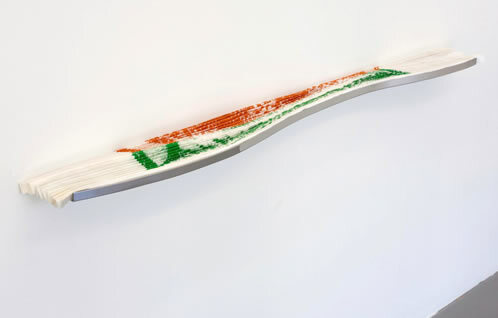 In fact, Channer has indirectly described her entire practice as a kind of property-changing, volumetric sleight of hand: "I always try to make something three-dimensional and yet all of the objects that I make are made from flat surfaces. I quite literally have to pleat, fold, stretch, curve, expand and contract in order to give them volume and to make them stand." 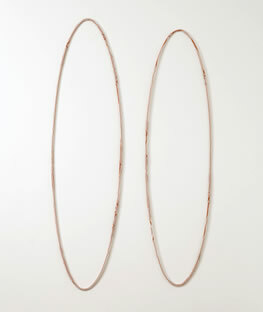 Sara Barker, another British artist, is equally concerned with conjuring volume from flat materials, with a suggestive use of negative space key to this endeavour (left). A striking resemblance in her work to pieces by Channer such as Eyes indicates how closely certain of the two artists' methodologies coincide. Nevertheless, Barker's work is both more formally homogeneous and more directly concerned with a reconfiguration of art histories than Channer's accent on apparel and its constituents. 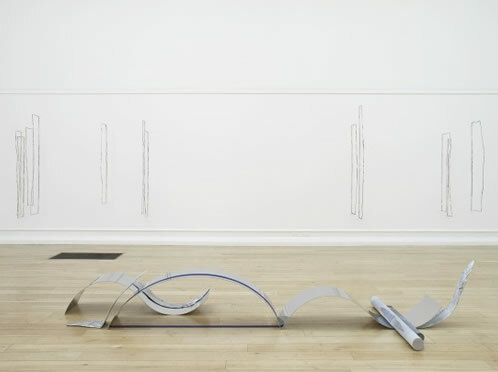 Barker deals in a near-immateriality, but the spaces she conceives are replete with association: Minimalist drawing and sculpture are obvious referents, with the work of Fred Sandback particularly relevant to her exploration of line, plane and volume using reedy scraps of painted aluminium and card. Yet a prevailingly expressive, gestural quality to Barker's practice marks a distinct departure from the neutrality of Minimalism itself. Purity of implied form is offset by haphazardness; slightly imperfect 'lines' are crusted with peeling, flaking paint (left). While perceptual illusion in Barker's work may appear principally centred in her renditions of absent mass, there's questioning, too, of the premise of sculpture itself in works that could almost be seen as drawings or paintings in pop-up. 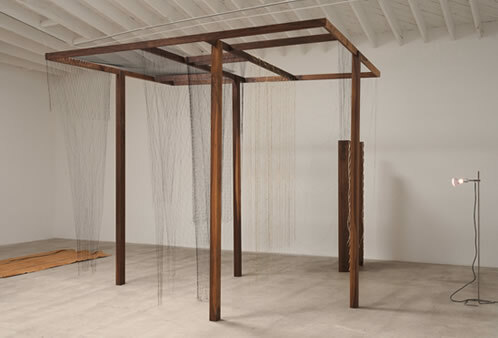 The space-defining potential of line-like structure is also very much in evidence in the work of Leonor Antunes, whose practice likewise investigates our inclination to perceptually transform enclosures of nothingness into intimations of greater surface, volume and mass. Linked to this endeavour is a survey of materials in which properties appear equally mutable, informed not only by their specific application but by contingency with other works. 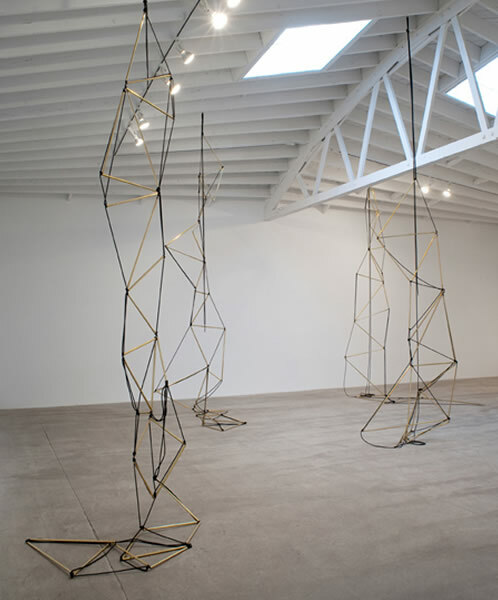 Antunes' ongoing Chain of Triangles series (below), features angular wire forms which, cascading from the ceiling, visually dominate space despite their barely-there physicality. 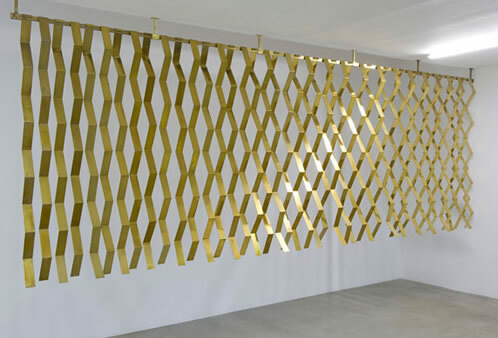 Similarly, 'curtains' or screens of linked metallic tubing suggest something of the solidity of a partition or wall, and such illusory tactics extend even further in structures consisting of slanted metal strips (below). Designed to be placed in front of a window or light source, the resultant play of patterned shadow and light initiates a sense of depth and volume lacking in the slightness of the structure itself . 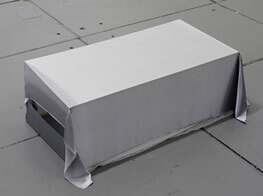 Not all of Antunes' works are physically lightweight, however, and much of the implied mutability that pervades her practice occurs through contrast and comparison with adjacently installed pieces or knowledge of her wider production. 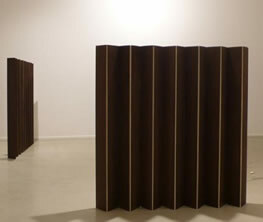 Stalwart chunks of walnut wood (Avoiding the Mistral Wind, versions 2012 and 2008, left and below left respectively) provide an indisputably robust counterpoint to the artist's fragile hangings, yet their nominal function as a form of screen is similar (it's also interesting to note that their concertina format, which allows for expansion and retraction, mirrors the properties of the fabric pleats used by Alice Channer (above)). 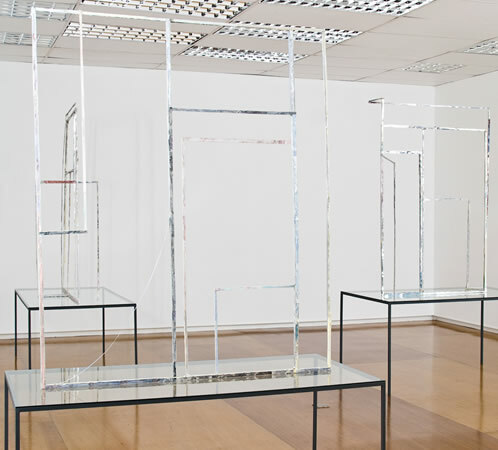 Yet in further timber-based works such as assembled, moved, re-arranged and scrapped continuously (2012, below), Antunes articulates the solidity of her material into structures that employ negative space to reduce - rather than activate or enhance, as is the case with her metal screens - a sense of density and bulk, the resulting impression one of surprising slightness and airy volume. 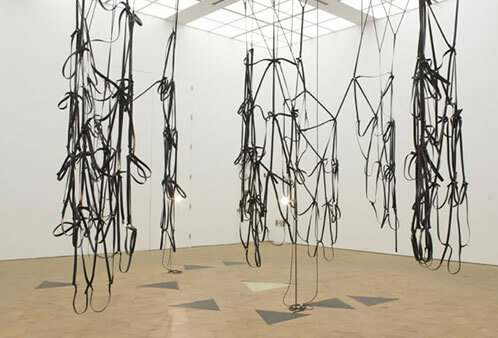 Leather is also a favoured material, used in a series of hanging works (Random Intersections, below) that partially reflect Antunes' suspended metal links and tubes and also suggest (as elsewhere in Antunes' practice) some visual affinity with the work of Eva Hesse. 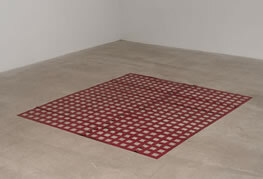 Yet they likewise relate to other leather-based works such as the carpet-like discrepancies with L.B. 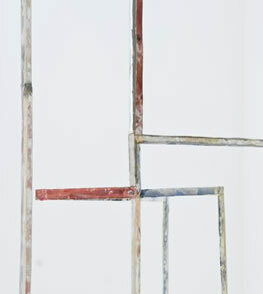 (2012, above left) - the incisioned absences of which equally echo the negative spaces in many of the pieces already discussed. 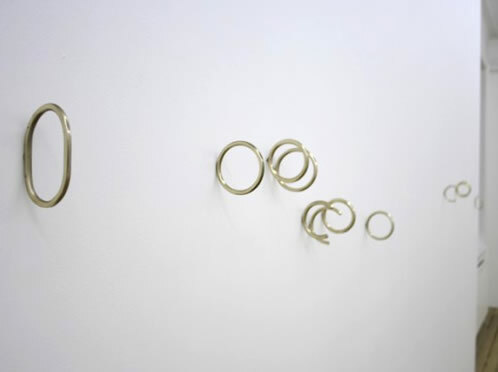 In fact, the process of interlinking is not only one of Antunes' most obvious methodologies, it also provides a kind of coda to to the experience of her practice, analogous to the overlaps and interconnections her use of materials and form suggests. Suggestion is equally integral to the work of Danish artist Tove Storch, although in her case formal structure and focus on material properties are extended into a kind of trompe l'oeil artistry specifically designed to confound and mislead. Storch - like Channer - is fascinated by fabrics, but consistently utilises their qualities to suggest the presence of materials quite apart from themselves. 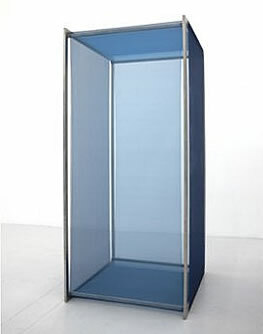 A series of block-like forms adopt monolithic dimensions and appearance, for example, but in fact consist of fine steel frames swathed in a silken skin (Untitled (blue), left). The discrepancy between apparently stolid monumentality and delicately lightweight materials is intense: these works consist of little more than fabric and air, but clearly suggest a far greater mass. Storch's Metal Objects (left) are similarly witty imposters: consisting of simple plinths draped in gold or silver satin, the fabric's hard sheen provides a surprisingly accurate impersonation of metal itself. 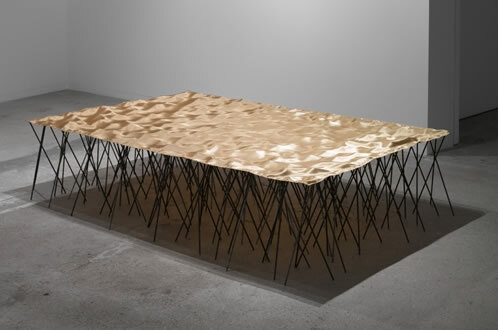 Occasionally, Storch complicates this device, as in the magisterial Floating Surface (2008, below), which suspends cloth over a bed of angled spokes to create a softly undulating surface that approximates a sheet of beaten brass. 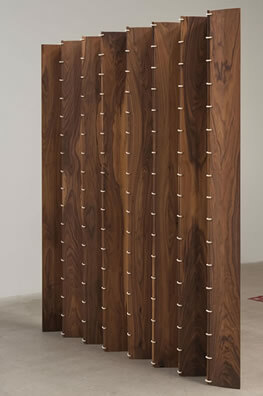 In other works, too, the innate properties of materials are confounded through suggestive titles and appearance. 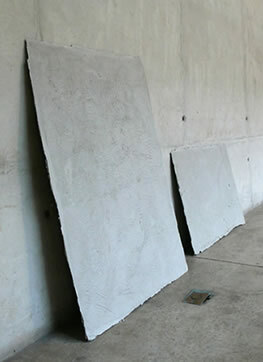 Concrete, for example, is cast into paper-thin expanses that resemble thick cardboard (Untitled (concrete sheets I & II), left); a boulder is partially hollowed out to drastically reduce its mass and weight (below). In Storch's practice, the perceptual play seen in the work of all four featured artists reaches a kind of apogee; with both material and form hovering between states of certainty and illusion.